My sister's birthday is coming up and I made her this card. I found a large blue envelope in my stash so it is a large card which is not my usual size but I felt called to make it bigger than usual for some reason!! I created a white card and layered on blue cardstock which I embossed with an organic embossing folder both top and bottom. I was happy to see that where they meet was not at all evident once the focal element was in place. The focal element is a piece of alcohol ink background which I found in my stash and it coordinated perfectly with the cool ribbon I found last week which I used to back the butterfly frames. 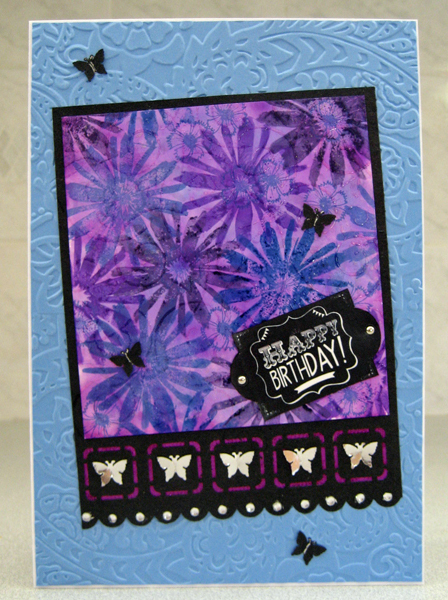 I stamped the background with a solid daisy (Magenta) in several different inks - light violet, purple, light blue and medium blue overlapping as I went. I used a small flower to fill in using the medium blue ink. I stamped and embossed in clear embossing powder a large swirly image then added some stippling around the edges using silver ink and embossed that too. It does not show well but I was wanting to echo the silver punchies I was putting over the ribbon. I mounted the background to a black piece which I had already punched with the butterfly frame punch and then the scallop border punch. I added the fussy cut greeting using tiny silver brads and mounted a piece of that gorgeous metallic ribbon in behind the butterfly frames using double sided tape. I mounted my large focal element to the front of my card. I mounted the silver butterfly punchies into the openings in the frames using tiny pieces of double side tape which leaves their wings free to be raised just a bit. I added clear rhinestones to the scalloped border just below them. I added four little black butterfly punchies (from the frame punches) to my card using the same double sided tape method as the silver ones. I used a silver gel pen to highlight their bodies.